Valkyria Chronicles 4 is a tactical role-playing game both developed and published by Sega. In this guide I’ll be discussing where to obtain Orders as well as the benefits they provide. In Valkyria Chronicles 4 orders can be learnt from fellow Squadmates and friends in the Mess Hall, or as players level up their Soldier’s Classes. Be sure to check in before and after each Chapter to ensure you won’t miss one in the Mess Hall. For class related orders, simply max out all classes. Orders may not seem paramount early on in the game but later on they will allow players to have more options on how they want to approach the mission at hand. All orders will cost experience and require CP. Valkyria Chronicles 4 is available to play on Playstation 4, Xbox One, PC and Nintendo Switch, but if you want to check out the game before purchasing, there is a free demo available for most platforms which covers the first three chapters. 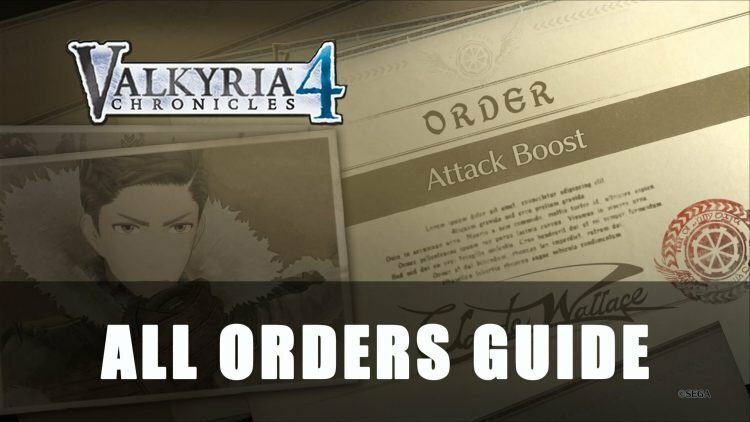 We will be adding more guides for Valkyria Chronicles 4 be sure to keep a look out in our guides section. Check out the first chapter in our Valkyria Chronicles 4 Prologue Guide and the second chapter Siege of the Castle.